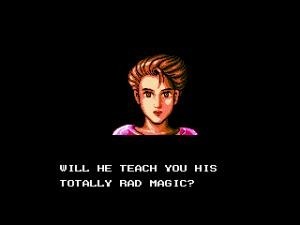 There is perhaps no better example of a localization team making meaningful changes to a game than the case of the 1991 NES platformer Totally Rad. When the game came out in Japan in 1990, it was called Magic John, and chronicled the adventures of an anime-style wizard's apprentice and his kidnapped girlfriend. The American version tells a similar tale, but replaces the anime kids with a rather bodacious surfer dude and his chick. Jaleco's localization team redid all of the art in the game's cutscenes with older looking Americanized characters. More impressive than that, though, was their translation of the fairly straightforward Japanese dialogue. Their instruction manual text features more surfer anachronisms than Point Break. Freelance game translator Shih Tzu has laid out the original Magic John cutscenes with his translations side-by-side with the Totally Rad versions on his website The Rad Project. What's impressive beyond the retro humor (bear in mind this game was released in 1991, when surfer speech was not nearly as passé as it is now) is how well the game is translated. Only a couple of times in the script did the translator misconvey what was being said in the original. They managed to completely change the tone of the game without changing the meaning of anything the characters said—an impressive feat. I hope so, Allison. For all our sakes. Some interesting graphical changes between Magic John and Totally Rad are worth noting as well. There is one scene early in the game where one of the new US character models has a couple of royal blue birthmarks about three pixels square on his cheeck that should definitely not be there. More intriguingly, one scene featuring the protagonist's girlfriend being held hostage. Upon close viewing, one can see that the localization team deemed it necessary to augment the breasts of the hostage for Totally Rad. This does make sense plot wise, given that the characters in Totally Rad are older than those in Magic John. That doesn't mean it isn't funny. Totally Rad is not an especially fun game. It plays very slowly, and is easily outshone by the many other solid side-scrolling platformers on the NES. But its dialogue is a hiliarious retro time capsule, whether it was meant to be or not, and hopefully The Rad Project will ensure that it remains available for future generations to enjoy.